Italy's borrowing costs continue to fall as investors bet the European Central Bank will backstop the nation's massive bond market. The Italian government sold €2.9 billion worth of 10-year bonds Thursday at a yield of 4.45%, down from 4.92% at the previous auction in October. It also sold €3 billion of 5-year notes at a yield of 3.23%, compared with 3.80% last month. Yields and prices move in opposite direction. In the secondary market, yields on Italian 10-year bonds fell to 4.47%, near the lowest levels since the euro crisis erupted in 2011. The results are a far cry from the record-high interest rates Rome was forced to pay earlier this year, when 10-year yields rose above 7%. Italy has enjoyed favorable market conditions since the ECB announced plans to intervene in the bond market for countries that commit to an official economic and fiscal reform program. Rome is not expected to tap the ECB's outright monetary transaction program, but the promise of potentially unlimited bond purchases has calmed jittery investors. Spain has also benefited from the potential ECB intervention. Yields on Spanish 10-year bonds were trading around 5.34% on Thursday, down from highs above 7% in July. The decline in Italy's borrowing costs comes despite tepid economic growth and an uncertain political outlook, with Prime Minister Mario Monti expected to step down next year. "There's a degree of complacency about Italy right now," wrote Nicholas Spiro, director of London-based consultancy Spiro Sovereign Strategy, in a note to clients. 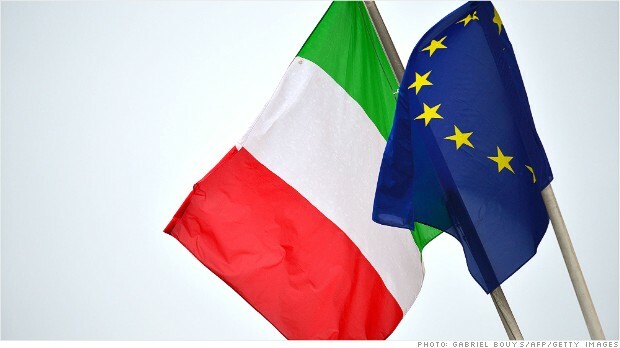 Investors are "overlooking the significant political and economic risks," he continued, pointing to the politics surrounding Italy's economic reform program and the severity of the nation's downturn.